The college football regular season is over and award season is upon us. On Monday, the ACC announced its three all-conference teams. Eleven Syracuse players were honored by the league for their play throughout the season. Considering Syracuse finished the season with the second best record in the ACC, a heavy presense on the list was expected. However, Andre Cisco was the only player to make the first team outside of kicker Andre Szmyt and punter Sterling Hofrichter. Third-most selections to the All-ACC teams in the conference with 9. 11 players honored in total. What an honor for Cisco. The dude was phenomenal all season long and gets rewarded by being named one of the top two safeties in the ACC. He’ll be a cornerstone in the Syracuse defensive backfield for years to come, unless the NFL scouts advise him otherwise. As for the specialists, what can you say? No surprise about Hofrichter, who was projected to receive the honor before the year started, but Szmyt came out of no where. Fans didn’t even know his name when the season started and he turned out to be a crucial part of the Orange’s year-long success. Props to Guthrie, who played the duration of the season in the shadows of Zaire Franklin. Guthrie got better as the season went on and ended up in the race for the conference’s leading tacker. Custis and Robinson were keys for the Orange this year and they both delivered. Perhaps the biggest question mark from the second team: did Trevor Lawrence deserve the honor over Eric Dungey? Dungey finished the season healthy for the first time in his Syracuse career. While he’ll go down as one of the best to ever dawn a Syracuse uniform, he never fully got the national respect he deserved. 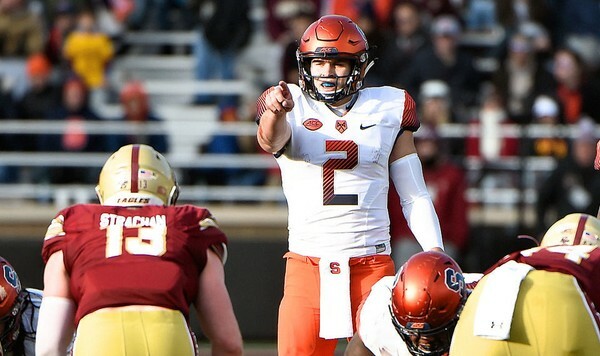 Although, finishing as the ACC’s third best quarterback is a big accomplishment for someone who has helped build this program from the ground up. Martin helped turn the Syracuse offensive line from a weakness to a strength. Without him, the Orange wouldn’t have been as strong up front and may of had to shuffle players in and out of their natural positions. Meanwhile, Sean Riley fulfilled his role in the SU offense and special teams this year, totaling 995 yards on the ground and through the air.